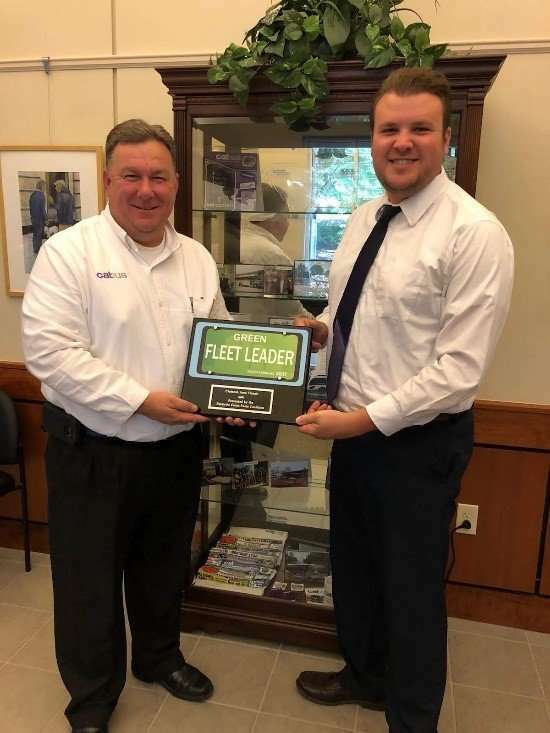 "PCF recognizes CATbus as a Green Fleet Leader for its commitment to providing quality mass transit services and using all-electric buses." SUMTER, SC – The Palmetto Clean Fuels coalition (PCF), an initiative of the S.C. Office of Regulatory Staff (ORS) Energy Office, presented Clemson Area Transit (CATbus) with a South Carolina Green Fleet Leader award during a city council meeting on Monday, June 4, 2018. As a US Department of Energy (DOE) Clean Cities coalition, PCF strives to help public and private entities, as well as individuals, lower fuel costs, improve air quality, and reduce petroleum consumption. PCF also promotes idle reduction, fuel economy measures, vehicle miles traveled reductions, and bicycle and pedestrian efforts. PCF recognizes CATbus as a Green Fleet Leader for its commitment to providing quality mass transit services and using all-electric buses. 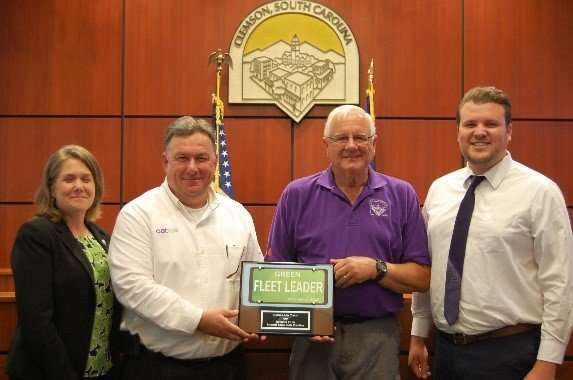 The Green Fleet Leader award is presented to the stakeholder organization that best demonstrates leadership and excellence in clean transportation and alternative fuel activities in South Carolina. 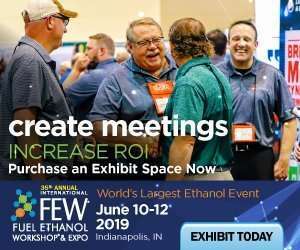 Awardees acknowledge the environmental, economic, and national security benefits of reducing consumption of fossil fuels and have implemented programs and initiatives to lower the use of “traditional” transportation fuels. CATbus is promoting the use of electric vehicles and advocating public awareness in alternative fueling solutions. 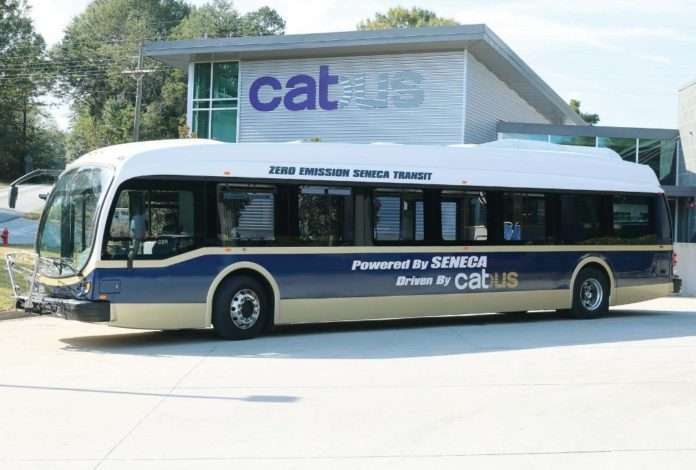 CATbus operates 33 buses along with the City of Seneca transit service, the only all-electric fleet of transit buses in the United States. Their services are provided to local residents and students fare-free through federal, state, and local partnerships in three counties, five municipalities, and four universities. But, is isn’t just the buses that make CATbus so deserving of this award. In 2011, the transit provider moved into its new state of the art, environmentally friendly headquarters which includes 210 solar panels. CATbus has been recognized by several groups and organizations for its commitment to sustainability and lower vehicle emissions. These accolades include Non-Profit Business of the Year, Green Business of the Year, the Spare the Air Award, and the Outstanding Achievement and Innovation to Implement SC Clean Transportation Award. CATbus has committed to convert its entire fleet to 100% electric by 2023 or sooner.